The vision of Concordia University, St. Paul, is to be acknowledged as the leading Lutheran university offering exceptional opportunities for students from all backgrounds who seek relevant career preparation and a challenging academic experience coupled with the insights of Lutheran theology. This year (Sept 2015) I enrolled in a SLD program. This was to address the needs of some of my student population at First City School. This is where I will keep the collection of resources I use and create. This course is designed to explore the various areas of exceptionality among children of school age. Awareness of the scope and nature of exceptionality, essential educational processes, available educational resources and best practices will be studied. A study of ethics and moral philosophy with application to the field of special education will be woven throughout the course. This course provides students the knowledge and skills needed to learn about and apply instructional strategies in pre K-12 classroom settings. Students will identify academic and behavioral needs as well as how to address those within different populations. Demonstrate an increased ability to analyze curricular situations and adapt instructional strategies accordingly. Apply collaboration skills as members of teams within inclusive settings, taking leadership roles in schools and programs. This is a study of the linguistic foundation of language and how that foundation relates to both linguistic difference and disability. Students learn how to facilitate the development of the reading skills in students with reading disabilities as well as the transference of those skills developed in one language to a second one. An investigation of literature and effective literacy strategies for the elementary classroom. Experience Component: Students must be able to understand and apply the standards of effective practice in teaching students reading through a variety of early and ongoing clinical experiences. This course will include an experiential component at the elementary K-5 level. This course is designed to increase the knowledge of and meet the academic needs of students who have been identified as having a disability that affects learning. Awareness of the scope and sequence of math and literacy skills needed in the academic areas of reading, writing, and speaking will be emphasized along with learning strategies and remedial approaches to educate the children identified with math or language difficulties. This course studies techniques with relation to collaborating with parents, caregivers, community services, and other support services to enhance the learning of the learner with special needs, within and without the academic setting. This course develops competencies in the use and interpretation of instruments to measure educational achievement, learning discrepancies, and inferential thinking and conceptual development. Emphasis is placed on the ability to develop and use formal and informal measures to monitor the progress of students and to determine the occupational and social needs, abilities, and interests of students. This course provides supervised practice in teaching learners with specific learning disabilities. Specialized interventions are used within a school setting. 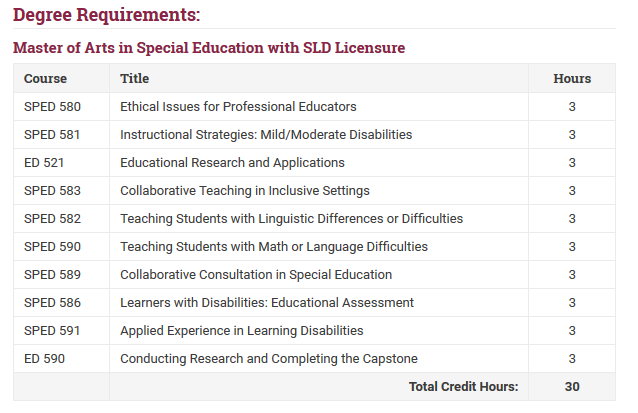 The Candidate will apply the MN Teacher Standards: 8710:5700 Teacher of Special Education: Learning Disabilities in teaching students with SLD in primary, intermediate or middle, and high school settings. A review and critical analysis of current educational research focused on a specific topic with research question. This course is grounded in the principles and practices of adult learning. The instructional model is collaborative, making use of student experiences to enrich and enliven class discussion. Knowledge will be constructed in the dialog between experience, reflection, and theory.